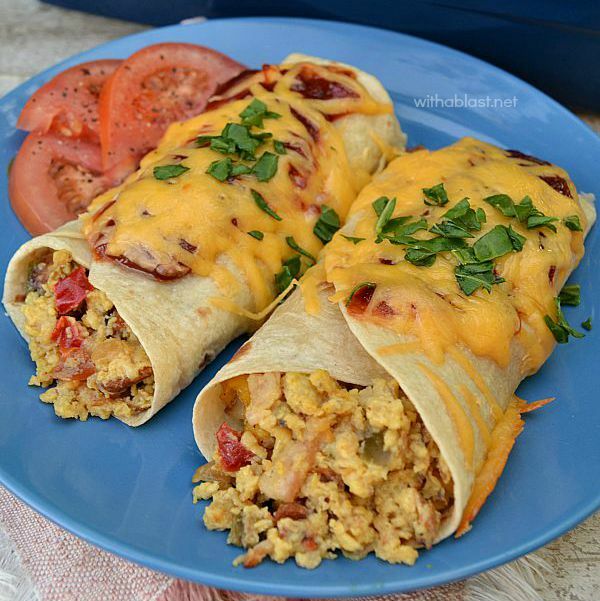 Whether you’re feeding a crowd or only a few family members, these very tasty Breakfast Burritos are ideal for brunches. Anyone for Breakfast Burritos ?? You can always count me in for Burritos, especially for breakfast or brunch. The recipe below is for 12 servings but you can easily half the ingredients if you are not feeding a crowd or just a very, very hungry family ! And these Burritos are not only for Breakfast, but can be served as lunch or even dinner with a side salad or two. We actually often have breakfast dishes for dinner, but I do try to avoid serving eggs (in any form) too late in the evening. One of our local frozen food’s suppliers have these small (250 grams – about 1/2 pound) bags of frozen chopped mixed Bell Peppers and they even have chopped Onions. Now the Onions I only buy a bag or two now and then, as Onions are always in season, but to have the Bell Peppers in the freezer is so convenient, especially when the fresh Peppers are out of season or very expensive. But in the end, nothing beats good old fresh Bell Peppers or any vegetable/fruit for that matter. You can use whichever, but defrost and drain well before use, if you decide on using the frozen kind. Add some greenery – parsley, chives etc (optional) and serve immediately. I love these, perfect for when you have guests too. Make them, then whilst they are baking you can get to the important business of making the coffee! I'm always on the go, and in need of a quick breakfast. This looks like the perfect way to stock up for the week. Thanks for sharing. Burritos for breakfast? Yes please, these look so delicious! I'm a huge believer in hearty breakfasts, and these beat a bowl of cereal any day!! 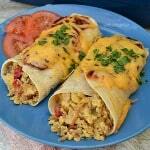 Breakfast burritos make life complete – one of my favorite foods. This recipe would definitely make my morning brighter! They sound absolutely wonderful!